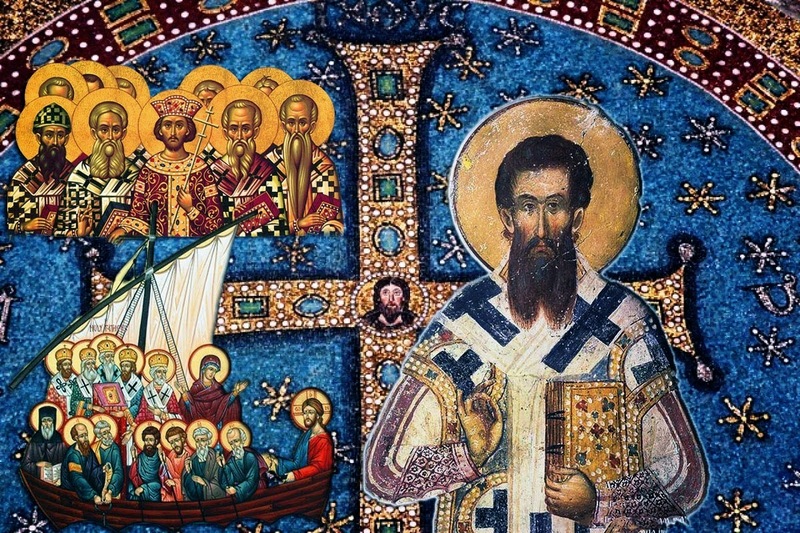 Among the little known works of St. Gregory Palamas is his Confession of the Orthodox Faith. It was written probably when he was in prison in 1343-1344, and it was probably first read publicly when he was ordained Archbishop of Thessaloniki in 1347. Most famously it was read by him at the second session of the Synod at Blachernae in 1351. According to the testimony of Gregory Palamas himself, his Confession possesses a precision rarely found in his other works. It presents the essentials of his theological system. The first English translation was made by Aristeides Papadakis in 1969, which can be read here. Below is a translation from 1993 by Reader Patrick Barker, now Hieromonk Patapios. The original Greek can be found at PG 151:763D-768C. One God before all, over all, in all, and above everything, do we worship and believe in, Father, Son and Holy Spirit. He is Unity in Trinity and Trinity in Unity, unconfusedly united and indivisibly divided, the same Unity and Trinity being all-powerful. The Father is without beginning, not only as being outside time, but also as being in every way without cause. He alone is the cause, root and source of the Godhead beheld in the Son and the Holy Spirit; He alone is the primary cause of what has come into being; He is not the Creator alone, but the sole Father of the one Son and the sole Originator of the one Holy Spirit. He always is, and is always the Father, and always the sole Father and Originator, greater than the Son and the Spirit, but only as cause; in all other respects He is the same as Them and equal in honor. Of Him there is one Son, without beginning, as being outside time, but not without beginning, as having the Father for origin, root and source, from Whom also He came forth before all ages incorporeally, immutably, impassibly, and by generation, but He was not divided from the Father, being God from God; not one thing insofar as He is God, but another insofar as He is the Son, He always is, and is always the Son, and always the sole Son. Always being unconfusedly with God (Jn 1:1), He is not the cause and origin of the Godhead apprehended in the Trinity, since He exists from the cause and origin of the Father, but He is the cause and origin of all that came into being, since all things came into being through Him (Jn 1:3), Who, being in the form of God, thought it not robbery to be equal with God (Phil. 2:6), but at the end of the ages emptied Himself, taking the form of a servant for our sakes (Phil. 2:7), and was by the law of nature both conceived and born of the Ever-Virgin Mary by the goodwill of the Father and the co-operation of the Holy Spirit, God and Man at the same time; having become truly incarnate, He was made like us in all things except sin (Heb. 4:15), remaining what He was, true God, uniting without confusion or change the two natures, wills and energies, and remaining one Son in a single hypostasis even after the Incarnation, performing all the divine actions as God and all the human actions as Man, being subject to the blameless human passions. Being and remaining impassible and immortal as God, but voluntarily suffering in the flesh as Man, He was crucified, died, and was buried, and rose again on the third day; He appeared to His disciples after the resurrection, and when He had promised them the power from on high and exhorted them to make disciples of all nations, to baptize them in the name of the Father, and of the Son, and of the Holy Spirit, and to teach them to observe all that He had commanded (Matt.28:20), He was taken up into heaven and sat at the right hand of the Father (Mark 16:19), making our mixture equal in honor, enthronement and divinity, the mixture with which He is going to come in glory to judge the living and the dead, and to reward each man according to his deeds (Matt. 16:27). It was then that after ascending to the Father He sent upon His holy disciples and Apostles the Holy Spirit, Who proceeds from the Father. He is co-beginningless with the Father and the Son as being outside time, but not without beginning, as Himself also having the Father as root, source and cause, not as generated, but as proceeding; for He also came forth from the Father before all ages immutably and impassibly, not by generation, but by procession, being indivisible from the Father and the Son, as proceeding from the Father and resting in the Son, having union without confusion and division without division. He is God and is Himself from God, not one thing insofar as He is God, but another insofar as He is the Paraclete; He is the self-subsistent Spirit, proceeding from the Father and sent, that is manifested, through the Son, the cause of all that came into being, since They were perfected in Him; the same equal in honor with both the Father and the Son, without ingenerateness and generation. He was sent from the Son to His own disciples, that is, He was manifested. For how otherwise would He Who is not separated from Him be sent by Him? How otherwise, pray tell, would He come Who is everywhere? Wherefore, He is sent not only from the Son, but also from the Father and through the Son; and He comes from Himself when He is being manifested. For the sending, that is the manifestation, of the Spirit is a common work. He is manifested, not according to essence, for no one has ever either seen or declared the nature of God, but according to the grace, power and energy which is common to the Father, the Son and the Spirit. For the hypostasis of each, and whatever belongs to it, is peculiar to each of these. Not only is the super-essential Essence, which is entirely nameless, inexpressible and incapable of participation, since it is above every name, expression and participation, common to Them all, but also the grace, the power, the energy, the radiance, the kingdom and the incorruption, and in general everything according to which God communicates and is united by grace with both holy angels and holy men. Departing from His simplicity neither on account of the divisibility and difference of the hypostases, nor on account of the divisibility and variety of powers and energies, we thus have one all-powerful God in one Godhead. For neither from perfect hypostases, could there ever come about any composition, nor could what is potential, because it has power or powers, ever truly be called composite by reason of potentiality itself. In addition, we accord relative veneration to the holy icon of the Son of God, who is circumscribed as having become incarnate for us, ascribing veneration in relative manner to the Prototype. We venerate the precious wood of the Cross, and all the symbols of His sufferings, as being true divine trophies over the common enemy of our race. In addition to the saving image of the precious Cross, we venerate the divine churches and places, as well as the sacred vessels and the divinely transmitted Scriptures, because of the God Who dwells in them. Likewise, we venerate the icons of all the saints, because of our love for them and for God, whom they truly loved and served, in our veneration ascribing the meaning to the figures depicted in the icons. We also venerate the relics of the Saints, since the sanctifying grace of the same has not departed from their most sacred bones, just as the Godhead was not separated from the Master's body in His three-day death. We know of nothing that is essentially evil; nor is there any other origin of evil than the perversion of rational men, who abuse the freewill given them by God. We cherish all the ecclesiastical traditions, both written and unwritten, and above all the most mystical and all-sacred Rite, Communion and Assembly, the source of perfection for all the other rites, at which, in recollection of Him Who emptied Himself without emptying and took flesh and suffered on our behalf, according to the divine command which He Himself fulfills, the most divine consecration of the bread and the cup is celebrated, in which the life-giving Body and Blood is accomplished. He bestows the ineffable communion and participation on those who approach in purity. We cast aside and subject to anathema all those who do not confess and believe as the Holy Spirit foretold through the prophets, as the Lord decreed when He appeared to us through the flesh, as the Apostles preached after being sent by Him, as our Fathers and their successors taught us, but who have started their own heresy or followed to the end those who have made an evil start. We accept and salute the Holy Ecumenical Synods: the one in Nicaea, of the 318 God-bearing Fathers, against the God-fighting Arius, who impiously degraded the Son of God down to the level of a creature and sundered the Godhead that is worshiped in Father, Son and Holy Spirit into created and uncreated; the one after it in Constantinople of the 150 holy Fathers, against Macedonius of Constantinople, who impiously degraded the Holy Spirit down to the level of a creature and no less than the latter sundered the one Godhead into created and uncreated; the one after it in Ephesus of the 200 Fathers, against Patriarch Nestorius of Constantinople, who rejected the hypostatic union of divinity and humanity in Christ, and completely refused to call Theotokos the Virgin who truly gave birth to God; and the fourth in Chalcedon of the 630 Fathers, against Eutyches and Dioscorus, who propounded the evil doctrine of one nature in Christ; and the one after it in Constantinople of the 165 Fathers, against Theodore [of Mopsuestia] and Diodorus, who entertained the same ideas as Nestorius and commended his ideas in their writings, and against Origen, Didymus and Evagrius, who were from an older period, but had attempted to infiltrate the Church of God with certain fables; and the one after it in the same city of the 170 Fathers, against Sergius, Pyrrhus and Paul of Constantinople, who rejected the two energies and two wills appropriate to the two natures of Christ; and the one in Nicaea of the 367 Fathers against the Iconoclasts. We salute also the Holy Synods that were assembled at particular times and in particular places by the grace of God for the confirmation of true religion and the evangelical way of life. Among these are the Synods that have been convened in this great city at the renowned Church of the Holy Wisdom of God, against Barlaam the Calabrian and Akindynus, who holds the same ideas as him and hastens to avenge him by treachery. They propound the doctrine that the common grace of Father, Son and Holy Spirit, and the light of the age to come, in which the righteous will shine like the sun, as Christ revealed in advance when He shone on Mount Tabor, and in general every power and energy of the tri-hypostatic Godhead and everything that in any way differs from the divine nature, is created, and they too impiously sunder the one Godhead into created and uncreated, calling ditheists and polytheists - as the Jews, the Sabellians and the Arians call us - those who piously honor the most divine light, and every divine power and energy, as uncreated, since none of those properties that belong naturally to God is recent. But we reject both the latter and the former as truly atheists and polytheists, and we completely cut them off from the pleroma of the pious, as the Holy, Catholic and Apostolic Church of Christ has done through the synodical Hagiorite Tome, believing in one tri-hypostatic and all-powerful Godhead, which in no way departs from unity and simplicity on account of the powers and the hypostases. In addition to all these affirmations, we await the resurrection of the dead and the unending life of the age to come. Amen.